Global citizens have the means and power today to end the threat from nuclear weapons, according to civil society representatives speaking at the United Nations High-Level Plenary Meeting on Nuclear Disarmament today. ‘Technology has created a global village,’ said Dennis Kucinich (USA), a representative of the Basel Peace Office, former US legislator and UN liaison for Parliamentarians for Nuclear Nonproliferation and Disarmament, who was one of the two civil society speakers selected by the President of the UN General Assembly. ‘When a greeting can be sent to the other side of the world in a matter of seconds, this represents the constructive power of global citizens, affirming our commonalities.’ (Read Dennis Kucinich full speech to the UN). 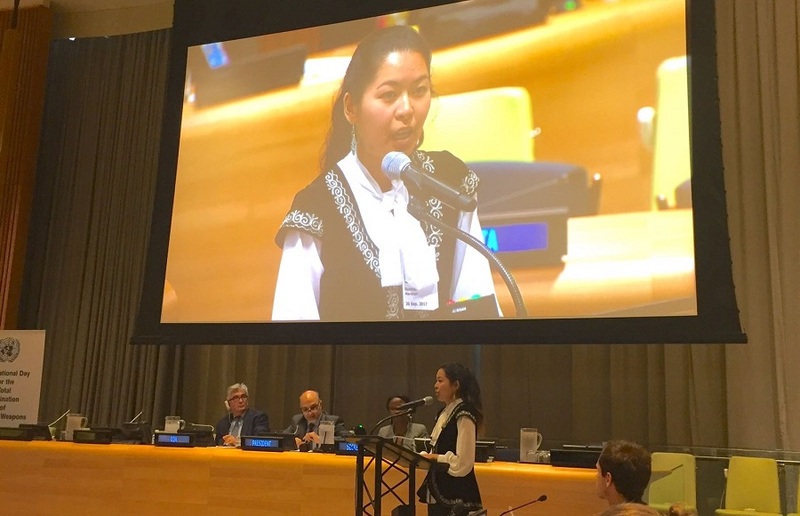 ‘I hope and believe that nuclear weapons can be prohibited and destroyed before they destroy us,’ said Marzhan Nurzhan (Kazakhstan), Convener of the Abolition 2000 Youth Working Group and the other civil society representative. ‘However, to do so we need to inform, educate and engage youth. We are the trend setters of today, the decision makers of tomorrow, and the guardians of the next generation.’ (Read UN speech Marzhan Nurzhan). The day-long meeting, held to commemorate the UN International Day for the Total Elimination of Nuclear Weapons, featured leaders of the world expressing their perspectives on nuclear weapons and how to achieve a nuclear-weapon-free world. Miroslav Lajčák, President of the UN General Assembly opened the event with a warning about nuclear risks, especially in North East Asia, and concern about the widespread adherence to nuclear deterrence. UN Secretary-General Antonio Guterres followed with a rousing speech calling on global cooperation to achieve a nuclear-weapon-free world. ‘A world free of nuclear weapons is a global vision that requires a global response,’ said Guterres. ‘Although the goal of such a world is universally held, he said, it has lately been subject to numerous challenges, including a series of provocative nuclear and missile tests conducted by the Democratic People’s Republic of Korea….There are multiple pathways to a nuclear weapon-free world. States possessing nuclear weapons have a special responsibility to lead by taking concrete steps, including those agreed at various review conferences of the Treaty on the Non-Proliferation of Nuclear Weapons. Key themes highlighted by governments included the need to resolve nuclear-related conflicts through diplomacy, and the opportunities for progress on nuclear disarmament through the new nuclear ban treaty and the 2018 UN High-Level Conference. These themes were reinforced by the civil society speakers. Marzhan focused on actions taken by youth to promote nuclear abolition, and support the 2018 High-Level Conference. Marzhan and other youth ‘Reaching HIGH for a nuclear-weapon-free world’ to promote September 26 International Day for the Total Elimination of Nuclear Weapons.